Brandi Glanville may be the newest bad girl in Beverly Hills, but it’s impossible not to love her for always speaking her mind. In this brash, candid, and vulnerable memoir, she spills all of her secrets, dishing on her infamous divorce, motherhood, the plastic surgery that made her “seventeen” again, and much, much more. She’s the brutally honest breath of fresh air on The Real Housewives of Beverly Hills, known for her dramatic divorce, her barely-there clothing, and her inability to keep her mouth shut. So why should she change now? Brandi Glanville tells all in this hilarious, no-holds-barred memoir. Fans have been waiting for Brandi’s scoop on one of the biggest divorces of the decade, since her husband of eight years abandoned her and their two sons to marry country singer LeAnn Rimes. Not only does Brandi spill the beans about her side of the split, the lovable housewife shares the incredible wild ride that took her from a life in the ghetto to Hollywood’s most elite circles. For the first time, Brandi talks about how she escaped a rough neighborhood on the outskirts of Sacramento and stumbled into a successful modeling career that swept her into a world of Paris Fashion Weeks, private jets, and uncircumcised penises. Before she knew it, Brandi was the perfect Hollywood trophy wife—at least until her marriage exploded. Today, the refreshingly filter-free housewife and unapologetic mom is the newest full-time cast member of Bravo’s juggernaut franchise, where she often elicits raised eyebrows and gossip from her costars for her refusal to be the scorned ex-wife, to be bullied, to change her sarcastic sense of humor, or—on most occasions—to wear a bra. 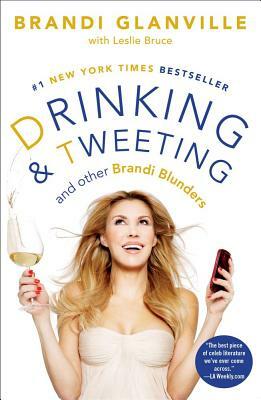 Sassy, raunchy, and compulsively readable, Drinking and Tweeting perfectly captures Brandi’s open-book attitude, as she dishes about everything from her DUI, her cheating ex, her one-night stands, and the secret plastic surgery that made her “seventeen” again. You’re sure to enjoy every page of this funny, upbeat, honest tale. Clear your schedule for an afternoon and grab your favorite cocktail, a comfy seat . . . and maybe a Xanax. But that’s for later. Brandi Glanville officially joined the cast of Bravo’s The Real Housewives of Beverly Hills in season three and quickly became the show’s most outrageous breakout star. She lives with her two sons, Mason and Jake. “Is there a Pulitzer category for memoirs by jilted reality stars who like to talk smack about ex-husbands and "bonus moms?" Because if so, this book should win it... The best piece of celeb literature we've ever come across."